October 3, 2017 | 9:30 a.m. Inside Communication Professors Leta and Phil Frazier's shared office, a small, electric heater defrosts snow-chilled bodies. But a different kind of warmth lingers long after visitors leave. For some, it's a physical feeling—as weighty and sure as Leta's large, silver cross necklace, or as soft and inviting as the Fraziers' extra office chairs. For others, it's emotional—the security of knowing the Fraziers "keep confidences" and value every person who walks through their door. Regardless, in the 35 years since Leta joined Bethel's faculty, and 25 years since Phil did the same, the warmth has touched thousands in the Bethel family. Nothing speaks more to this than the endeavor of alumni Gus Broman '92 and Dana Ripley '92, who are establishing a scholarship in the Fraziers' name. Broman says the idea has been in the works for years and—with their 25-year Homecoming reunion fast approaching—now seemed like the perfect time to put it into action. "I believe that people appreciate Bethel and their experience," Broman says. "But it isn't until you tie specific effort to specific impact that people will respond." By working with Ripley to create the Dr. Leta and Dr. Philip Frazier Communication Scholarship, Broman hopes his classmates will be inspired to give to Bethel, too. "My heart's desire is to see that happen and to see Phil and Leta honored at the same time," he says. Some details of the scholarship have yet to be finalized, but in starting this process, half of Broman and Ripley's mission has already been achieved. "We both cried when Gus told us," Leta says. "Well, it was just a shock," Phil adds. While both were moved by the gesture, they maintain that the scholarship isn't about them. "It's about our students through the years, and future students in the field of communication," Phil says. "[That's why] I'm sure, like other people, we will contribute to this scholarship." Leta nods her agreement, adding, "We believe with all our hearts that communication is central to life." Their passion hasn't gone unnoticed by the wider Bethel community. 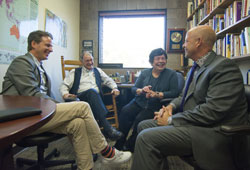 "Throughout their careers [the Fraziers] have been committed to providing transformational learning experiences for students," says Executive Vice President and University Provost Deb Harless, who's known the Fraziers for 25 years. "They've poured into the lives of students across all of our schools in the university." They've poured into the lives of their colleagues, too. "Leta and Philip are delightful colleagues," Harless says. "When you're in their presence they give you their full attention in a way that communicates that you matter to them." Broman and Ripley have maintained a close relationship with one another since their days as captains of the Bethel men's soccer team. They've been connected with the Fraziers for just as long and worked as teacher assistants (TAs) for a number of Leta's and Phil's classes. Though Broman jokes that the Fraziers "never cut him slack"—even as their TA—the extra time together left a meaningful impression on both ends. "They were both in and out of our office many times a day," Leta says through a wide grin. "They're fun men. They were fun students, but always respectful. We love them dearly." For Broman and Ripley, the Fraziers' impact has extended far beyond fond memories from college. As both established careers in the field of communication, lessons from the Fraziers had a daily professional impact. Today, Broman is a communication consultant for Fortune 100 companies and Ripley serves as the chief communications officer for U.S. Bank. Beyond the professional, Broman says the course "Family Communication" impacted the way he interacts with his family of five and inspired Bridge to Teen—a book he wrote with his wife meant to help "bridge the gap between childhood and adolescence." Leta's "Family Communication" class and Phil's senior-level general education course, "Family Interaction," are taught by breaking students into groups of "families," and assigning them roles within their families. Leta and Phil then write simulations for the students to act out in these groups. They call this a "systems perspective," because it helps students learn that in each family, an individual's actions affect the rest of the members. Establishing this kind of hands-on learning model was one of Leta's early teaching goals. "I took a family communication class when I was doing my Ph.D., and it was all lectures," she says. "And it was deadly." Now, Bethel is one of a select few schools to teach multiple experiential communication classes. That's not to negate the plethora of traditional courses the Fraziers have also taught during their many years at Bethel. Since she signed on to be the first female professor in the Department of Communication Studies, Leta has taught nearly every course offered at the undergraduate and graduate level. Phil, too, has taught communication to undergraduate and graduate students, as well as a number of leadership classes in the graduate school. Recently, they've enjoyed having children of former students in class—like Ripley's daughter Kayley '17 and son Rob '21, who are a communication major and media communication major, respectively. Through those years, some things have changed. Earlier in her career, Leta was notorious for memorizing all of her students' names after only one class. "I find I can't do that now; I can't remember them at 80 the way I could at 45," she says. "It takes longer. And that irritates me so!" But other things haven't changed. "Bethel as a whole has been extremely important to us," she says. "Our teaching is most important. We still take our teaching extremely seriously." Broman believes that's exactly why the scholarship will strike a chord with alumni. "[The Fraziers] seriously were everyone's favorites," he says. "Not because they were easy, but because they made you bring your best." To give to the Dr. Leta and Dr. Philip Frazier Scholarship, visit bethel.edu/giving/donate/leta-and-philip-frazier-communication-award. Or, learn about Stock Gifts and how you can advance Bethel's Mission.